View More In Roadhouse Country. From the vaults of the award-winning PBS Austin City Limits TV show, this is the latest release in the acclaimed Live From Austin, TX series. Maybe it was an epiphany of sorts. 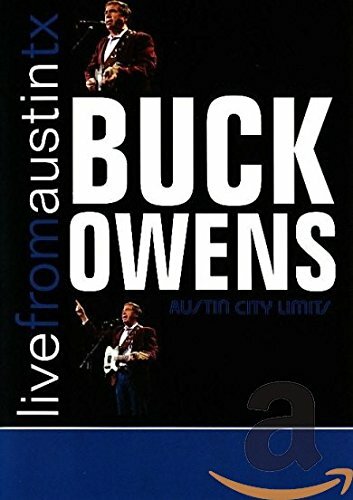 As Buck tells it, One day I was watching Austin City Limits and Dwight Yoakam was on, then he dedicates the program to Buck Owens. So I said, I m going to see what this kid is like. It wasn t long after that he was on stage with Dwight singing his old hits. Buck was bitten by the bug to return to music, after calling it quits almost ten years earlier. This man from Sherman, Texas probably best-known as the wide-grinning rube on Hee Haw for so many years started a country music revolution. Or more accurately, a counter-revolution. It was called the Bakersfield Sound, He and fellow revolutionary Merle Haggard were cranking out raw, hard-driving honky-tonk music that stood the country-pop coming out of Nashville on its head. When Buck Owens and the Buckaroos would launch into I ve got a tiger by the tails, it s plain to see...! the packed crowds would be on their feet and headed for the dance floor. Along the way Buck inspired none other than the Beatles to record their first country song, his classic Act Naturally, and the master of soul, Ray Charles, to immortalize one of the best-known country songs ever, Cryin Time. This DVD, recorded live on October 23, 1988 in 5.1 surround sound, captures all the hits and more, and includes songs that were never aired on the original TV broadcast. If you have any questions about this product by RED Distribution, contact us by completing and submitting the form below. If you are looking for a specif part number, please include it with your message.